A Painting Today: "100 Faces, No. 9"
I got a little bold with the palette knife. Seems like my brain tells me to follow the mood of the face itself - if it's intense, the surroundings could somewhat pick up on that. I'm really liking your faces. 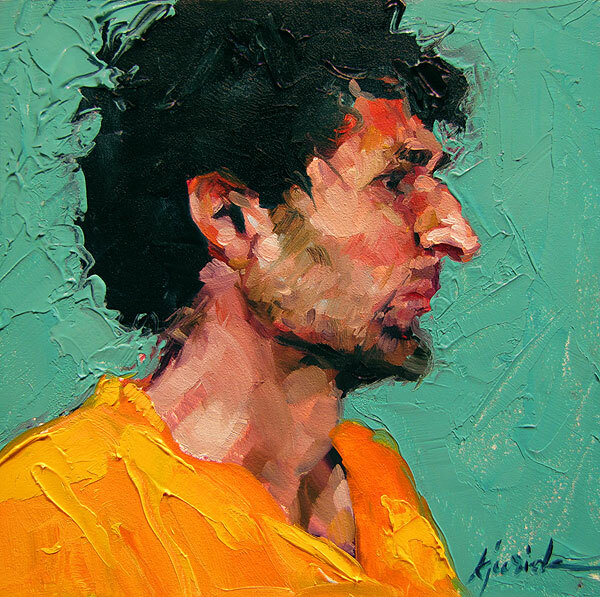 Amazing brushwork... oops, palette knife work on a 4x4". And the colors are intensely luscious. I am loving, loving, loving all of these. This is a great one! I really like the palette knife work. Outstanding! My favourite of the series so far. what an undertaking! I love the bold yellow and green blue, and the sideways shot. very very cool. Of the first ten, this one is my favorite. Karin, I love the knife work. I can't resist adding knife strokes to my work as well.